Great oportunity to attend an Open House this Sunday November 3rd from 2-4pm. This home is a true beauty with custom details throughout. You'll love the wonderful kitchen and relaxing covered back deck. Click on the above picture to learn more about this ohome or contact one of our agents today to learn more about Louisville Real Estate. Directions: Brownsboro Rd (22) to Springdale. Left on Wolfspring Pkwy, Right on Street. 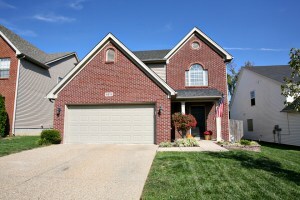 8813 Eli Dr Louisville KY 40291 is a fantastic move in ready 3 bedroom home in Cedar Glen. The front porch and tiled entry foyer greet guests and lead into to a spacious Great Room with plenty of natural light and a warm fire place. A pass through breakfast bar separates the kitchen from the welcoming dining area. The Kitchen includes lots of cabinet and counter space as well as modern appliances. A half bath rounds out the first floor. The second floor contains a spacious Master Bedroom with private Master Bath complete with walk in shower, walk in closet, jacuzzi tub, and double vanity. The second floor also includes 2 more good sized Bedrooms, a Laundry, and a Full Bath. The back of the home has a pretty patio area and grassy space enclosed by a six foot wood privacy fence. 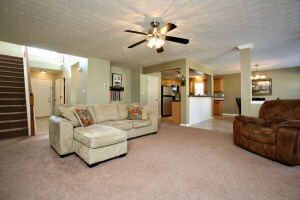 8813 Eli Dr Louisville KY 40291 showcases neutral decor throughout. The home has been meticulouslly maintained and it shows! New owners will love the neutral decor and updates including fresh paint in the garage, faux wood blinds, and ceramic tile in the foyer, kitchen, dining area, and half bath. The seller is offering a one year home warranty with National One Home Warranty! Give us a call today to learn more about this wonderful home and let us update you about the Louisville Real Estate market. Three fantastic homes will be open for viewing this Sunday October 27th, 2013. Check out one or even stop by all 3! One of our qualified Keller Williams agents will be at each home and will be pleased to share property information and give you the latest information about Louisville Real Estate. The open houses this weekend are located in Cedar Glen, Langdon Place, and Wolfcreek subdivisions. Take a drive through these beautiful East End neighborhoods and tour a lovely home! Click on the photos of each property to see full property details and see directions below! Directions: Bardstown Rd to Cedar Creek, R to stay on Cedar Creek, 2nd left onto Collier Ln, 1st Left onto Eli Dr. Directions: Goose Creek to Langdon Drive. Right on Street. Looking for something to do this Sunday? Check out these two beautiful homes. Both properties will be held open this Sunday October 20th from 2-4pm! 4615 Wolfspring Dr is a four bedroom brick home in the Wolfcreek subdivision and 7702 Adam Steven Circle offers 3 Bedrooms on a cul-de-sac lot in desirable Bradford Grove! Call 502-371-1173 for more information on either home or to learn more about Open Houses in Louisville Ky.
7702 Adam Steven Circle Louisville KY 40220 sits on a quiet cul-de-sac lot in the sought after Bradford Grove subdivision. Bradford Grove features a neighborhood pool and clubhouse and is located in close proximity to Taylorsville Rd. and Hurstbourne Parkway. 7702 Adam Steven Circle Louisville KY 40220 opens to a lovely two story Great Room with vaulted ceiling and fireplace with tile surround. Hardwood flooring flows from the Great Room to the Formal Dining Room with crown molding detail. The Eat In Kitchen is perfect for entertaining with modern appliances, breakfast bar, plentiful cabinet space, and a spacious dining area. The first floor Master Bedroom showcases abundant natural light and hardwood flooring as well as a private Master Bath with tiled tub and walk-in shower. The first floor also includes a Laundry Room and Half Bath. A large second floor Loft overlooks the Great Room and is a fantastic spot to gather for an evening movie. The second floor also includes two good sized Bedrooms, a Full Bath, and a walk in attic storage area. The Basement is partially finished with a welcoming Family Room complete with built in shelving and recessed lighting. There is also a unfinished portion of the Basement for storage or future completion. The property features a two car attached garage, high efficiency furnace, and newer roof. The back of the home has a great deck for grilling and relaxation as well as a grassy space beyond. Call today to learn more about this home In Louisville. We would love to assist with your home search. 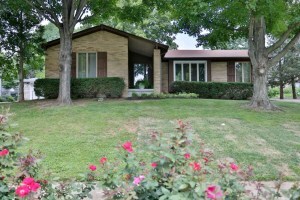 9408 Michael Edward Dr Louisville KY 40291 is a wonderful 3 Bedroom ranch in the Idlewood neighborhood. The home features a nice Living Room with netural walls which leads into the Eat In Kitchen with pantry, newer oven, plentiful cabinetry, and pleasant dining area. The Kitchen overlooks a comfortable Family Room with lots of natural light and a wood-burning fireplace. The Master Bedroom has a private Master Bath with walk-in shower. Two additional Bedrooms and a Full Bath complete the first floor. The unfinished basement contains a Laundry Room and tons of storage space. The basement could also be finished for additional living area. The manicured lawn, fully fenced back yard, and patio area off of the family room are the perfect spot for outdoor enjoyment. The open area beyond the fence will not be developed and provides even more space for outdoor games. 9408 Michael Edward Dr Louisville KY 40291 features a newer roof, furnace, water heater, replacement windows, and walk in tiled shower in the Master Bath. New owners will love the easy access to shopping and dining along Hurstbourne Parkway and Bardstown Rd. Call today to set up a private showing and our Louisville Real Estate Agents will be glad to assist you with your home search. Join At Home In Louisville Real Estate Group this Sunday October 13th from 2-4pm at this lovely home in Wolfcreek! What a beauty! Four bedroom brick home in a fantastic neighborhood! Meticulously maintained, custom details, and covered back deck. Click on the photo above for full property details or contact our team at 502-371-1173 to learn about other Open Houses in Louisville Ky.
7822 Cedar Grove Rd, Shepherdsville, KY 40165 sits over just over two acres in the Bleemel Heights neighborhood of Shepherdsville. The front porch entry leads to a lovely Living Room with a stone fireplace, crown molding, and neutral decor. Red Oak Hardwood flooring runs throughout most of the main level. 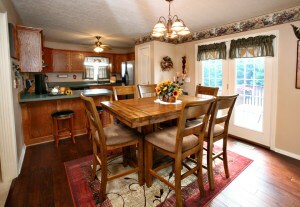 The Kitchen offers plentiful cabinetry, custom back splash, and a dining area. The Master Bedroom has a separate exit to the deck and pool area and is highlighted by crown molding and a private Master Bath with walk-in shower. There are two other good sized bedrooms positioned conveniently to a Full Bath and Laundry Room. The home has a fully finished basement with a Family Room, second Laundry Room, and Full Bath. Three other completed rooms on the basement level offer fantastic additional living area and could serve as bedrooms or office space. 7822 Cedar Grove Rd, Shepherdsville, KY 40165 features a gorgeous back yard complete wtih above ground pool, deck, hot tub, large grassy space, and large two level storage shed. When you want to sell your home in Louisville, one of the most important questions you have is, "how much will my home sell for?" One way to simplify things and get a clear understanding of this is to understand home values. Home Values must be understood from the point of view of the big picture to really get a clear perspective for what home prices have done historically. This helps us understand what is going on so we can get a better idea of what will happen now and in the future. Do do this, let's look at median home prices nationally. Home values increase at a rate of 4% annually. Looking at the yellow line in chart here we can see that from the years1989 to the years 2001 home values steadily rose 4%. Then, from 2001 to 2006 prices rose dramatically. 2006 through 2011 we can see prices decline. Now look what is happening from 2011 to 2013. Prices are beginning to rise again. The number on the yellow line is $241. That is, according to historical home prices, the national median home price for the year 2013, is $241,000 dollars. Currently, we are at $193,000. So, this year, national home prices are still undervalued. 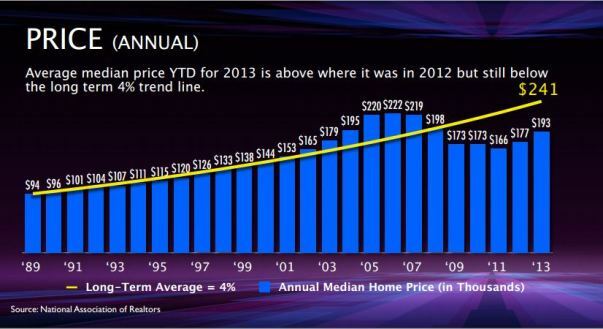 The truth is, home values are trying to get back to this yellow line. If it gets too far above it, it will adjust. If it gets to far below, it will also adjust. So, as we move forward, which way do you think home values will move in 2014, up or down? We've been looking at the national median trend to gain a holistic perspective on home values in the real estate market nationally. That helps us see through some confusion and get some clarity. That's great. We must also understand that real estate is a local business. We know this intuitively. Some neighborhoods are selling great at certain prices while homes in other neighborhoods are not selling nearly as well. Factors depend on neighborhoods and even particular streets in certain neighborhoods. There is no better idea than consulting with a Louisville Realtor to understand the neighborhood, and what is happening with home values on this particular street in this particular neighborhood. We hope when the time comes for you to make that decision, you will consult with us here At Home In Louisville 502-371-1173. 435 Stoneridge Drive, Fisherville, KY 40223 is a beautiful home with three Bedrooms, three Full Bathrooms, and an above ground pool! The house has a spacious interior and sits on a large lot in the Stoneridge Estates neighborhood of Fisherville, just minutes from the Gene Snyder! The front entrance opens to an attractive Foyer with hand scraped hardwood flooring. 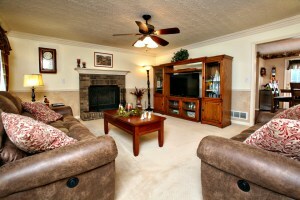 The Family Room showcases a brick fireplace and crown molding. 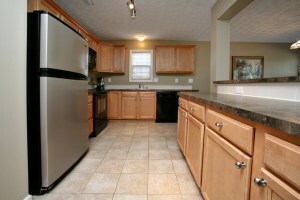 The Kitchen offers abundant cabinetry, a breakfast bar, and hardwood floor. There is also a good sized dining area. The first floor Master Bedroom is highlighted by a tray ceiling and has a private Master Bath with dual vanity. The Laundry Room is also postioned on the first floor. The second floor contains two nice secondary Bedrooms and a Ful Bath. The walk-out Basement Family Room showcases a second fireplace and exits to the back yard. The Basment level also contains a Den and a Full Bath. The Back Yard is a wonderful retreat with a deck, patio, expansive grassy yard, and above ground pool with wrap around deck! 435 Stoneridge Drive, Fisherville, KY 40223 has numerous updates including new Stainmaster carpeting on the upper floors, several replacement windows, french doors, replacement garage doors, and tile entryways in the basement. Join our team of Realtors in Louisville KY this Sunday October 6th from 2-4pm at two fantastic Open Houses! 4615 Wolfspring Drive is a 4 Bedroom 4 Bath home in Wolfcreek & 9408 Michael Edward Drive is a 3 Bedroom, 2 Bath home in Idlewood. Click on the photos to see full property details!